Madonna said the video's storyline was about "helping your fellow man"
Madonna's Like a Prayer, condemned by Christian organisations as blasphemous upon its release in 1989, has topped a poll of videos which "broke the rules". 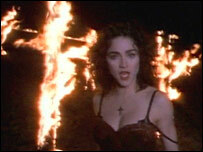 The clip showed the singer dancing around burning crosses and kissing a black Christ-like figure in a church. It came first in a survey of 10,000 MTV viewers, with Madonna's songs Ray of Light and Vogue also in the top five. Baby One More Time by Britney Spears was number two, with Michael Jackson's 13-minute epic Thriller in third place. Madonna - one of the icons of the MTV age - has been excluded from the network's playlist on more than one occasion because of the content of her videos. It refused to show Justify My Love in 1990 because of its sexual themes. Erotica and What it Feels Like For a Girl - depicting an angry woman on a crime spree - would be screened only in the early hours when they were released in 1992 and 2001 respectively. Spears's video, which featured her dressed in school uniform, was her debut hit, and reached number one in the US and UK in 1999. The release of Thriller 23 years ago was a global news event. It was directed by John Landis, who was behind the film An American Werewolf in London. It broke the record for the longest video and featured Jackson and a cast of zombie-like characters. Jackson and his sister Janet shared a duet on Scream, a futuristic black-and-white video from 1995 which is at number six in the MTV survey. Rock DJ by Robbie Williams is in seventh, and was edited for pre-watershed viewing because it featured the singer peeling off his own skin. Leotard-clad women were the stars of Eric Prydz's dance hit Call on Me, which made eighth place. Jamiroquai's Virtual Insanity - in which the band's lead singer Jason Kay appeared to be dancing in a room with moving walls - and the Spice Girls' single-take Wannabe made up the rest of the top 10. The full top 100 will be played as part of MTV's 25th anniversary on 1 August.